Okay, this is not the post in which I show you photos of Emily's and Jenna's back-to-school handmade gifts. 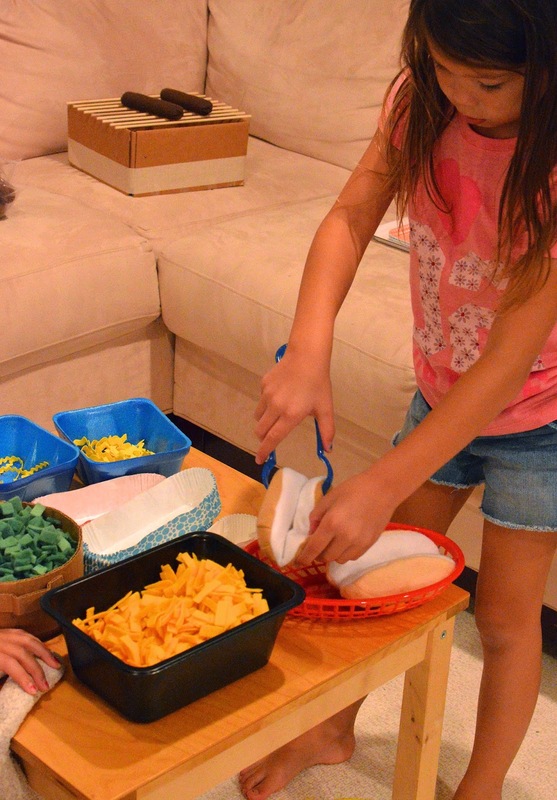 Instead, this is the post in which I show you my newest addition to the fake-F&B entrepreneurship that is a big part of my kids' pretend play. 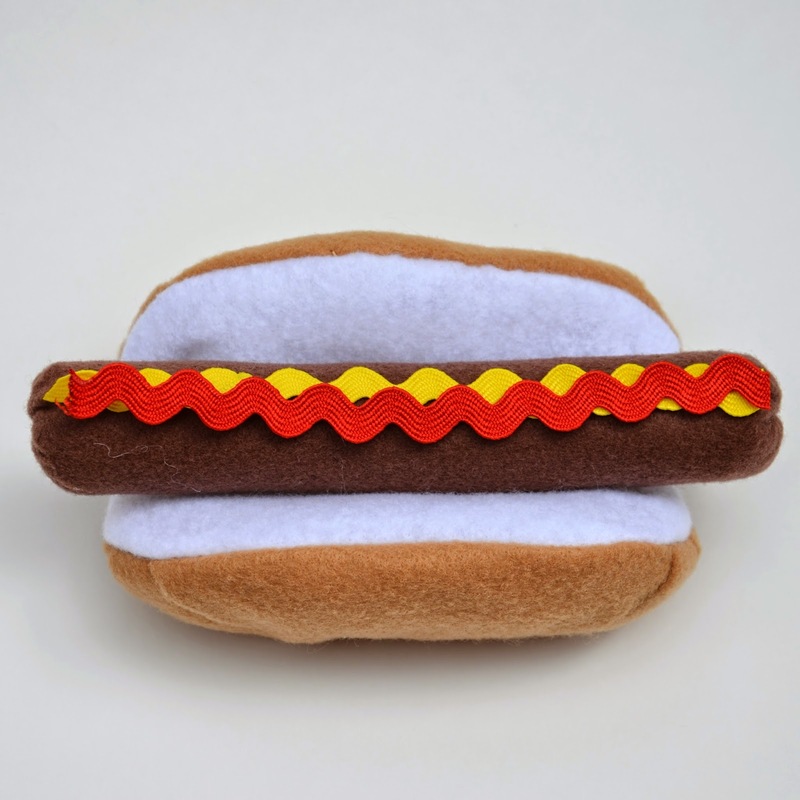 In the tradition of our felt pizzeria, we've mass-produced hot dogs to feed the er... masses. 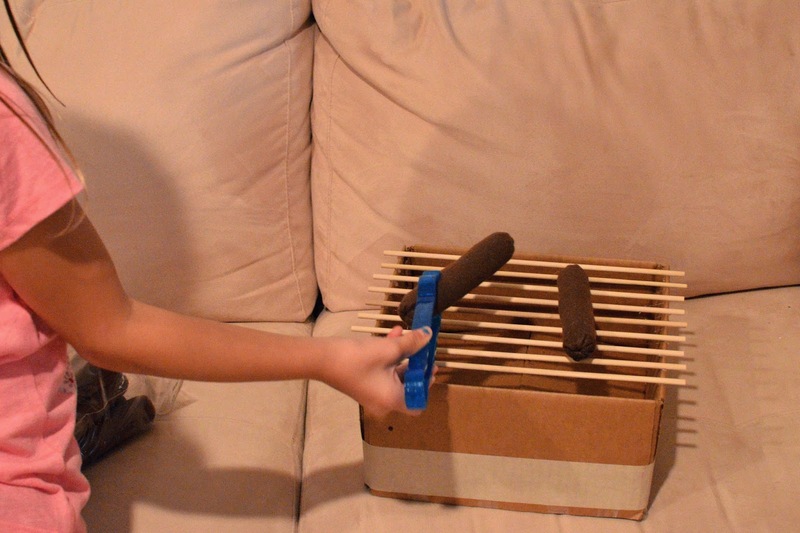 and the kids were mesmerized by the assembly-line process of getting their hotdogs from cooker to serving tray. 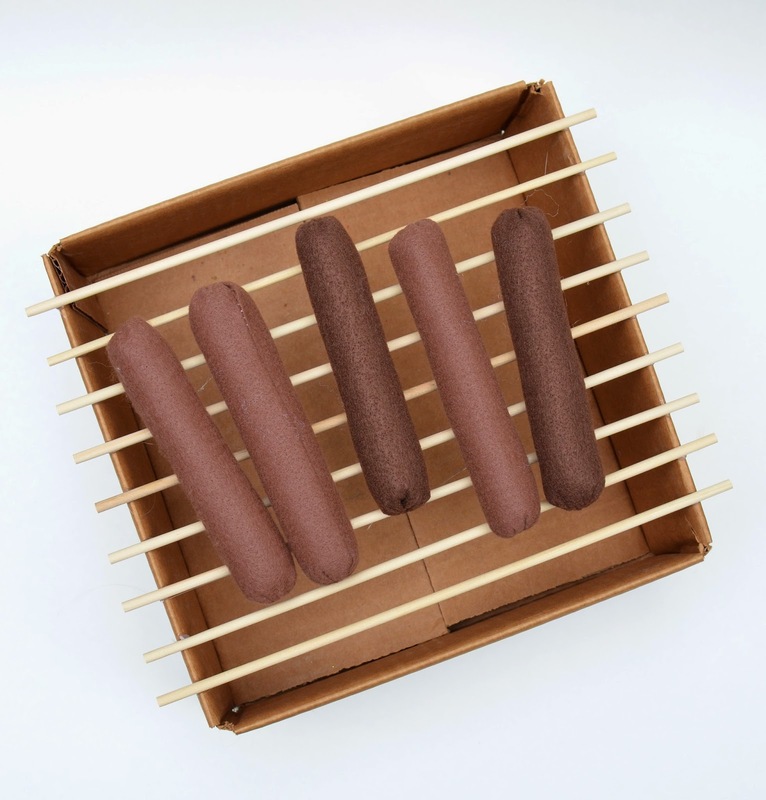 We've talked about making a hot dog restaurant ever since, but you know how it is with school and chores and those hundreds of other projects, right? 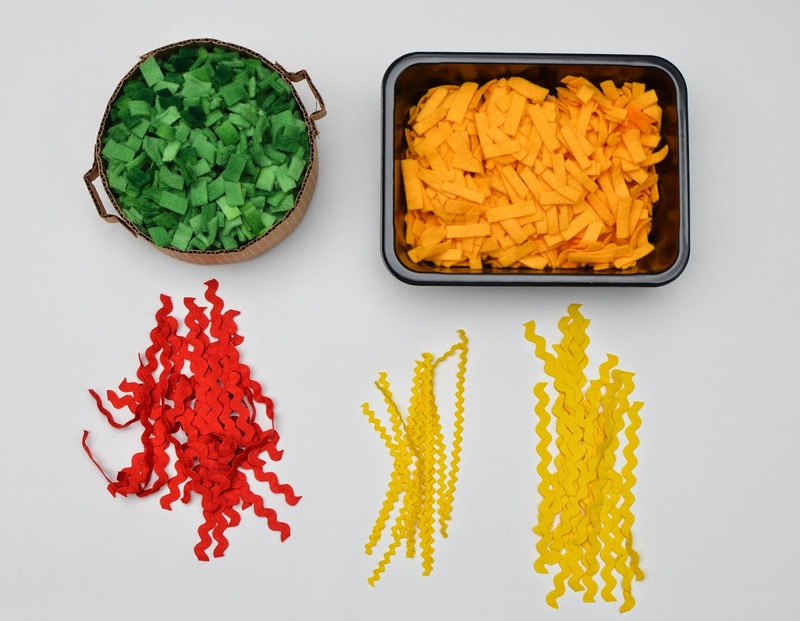 The ones scattered liberally along the road to good intentions where, like annoying Lego bits and Barbie bobs, they are trampled painfully underfoot while you're hurrying on your way to Other Greater Things? 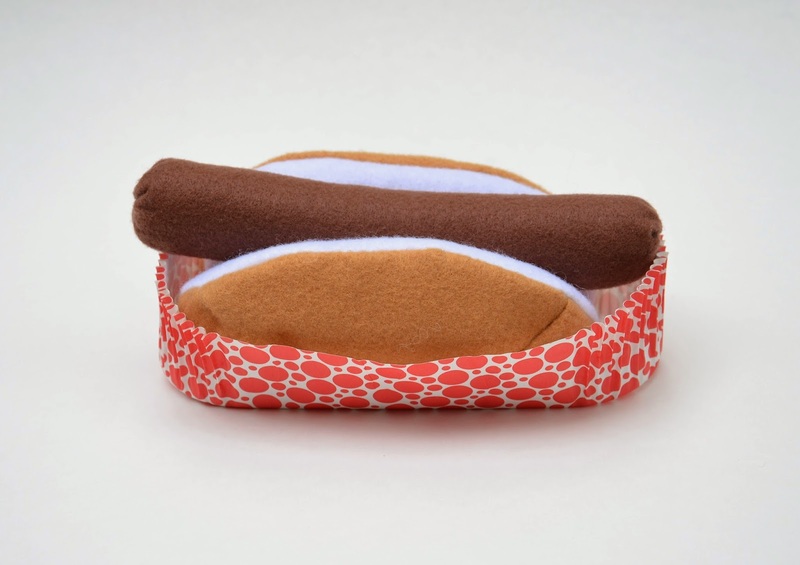 All that to say that it took me a whole year to get the hot dogs on the handmade roster. Although, if I consider some of my other WIPs (cough), it is actually quite a quick turnaround. It was about a week and a half from draft to finished product which is, again, very fast, especially since I was also concurrently hand-making the kids' first-week-of-school toys and doing all the school prep and back-to-school meetings with teachers and so on. 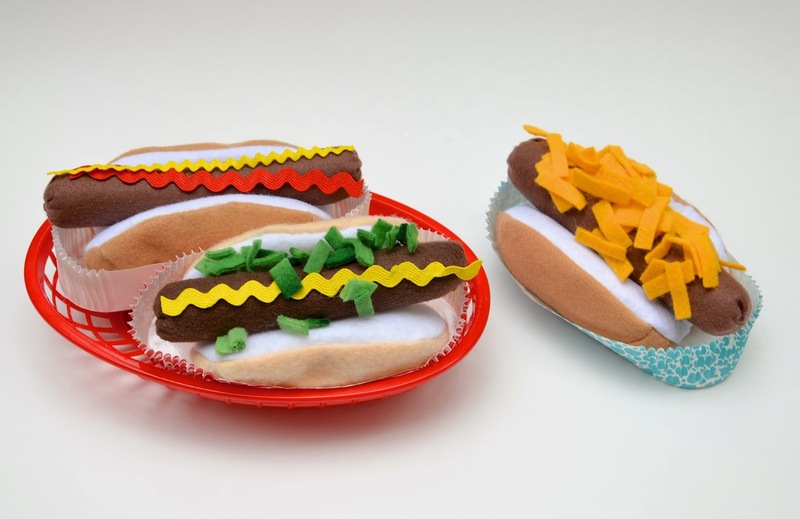 This is not me boasting about my non-procrastinating ability (because we all know how good I am in that area) or my skill at felt-food making, but to prove that it is really a very easy project. We'll get to that later in this post. 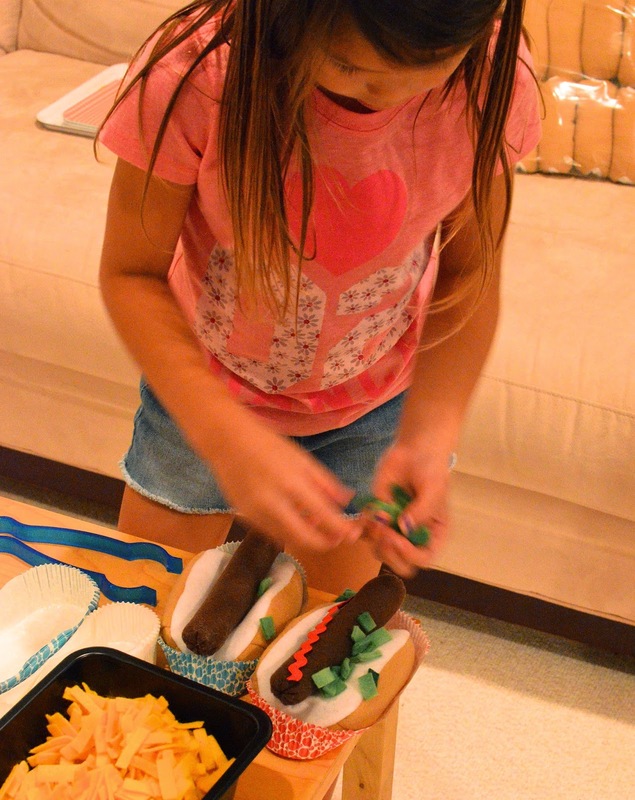 Anyway yesterday, the kids got to play hot dog restaurant. 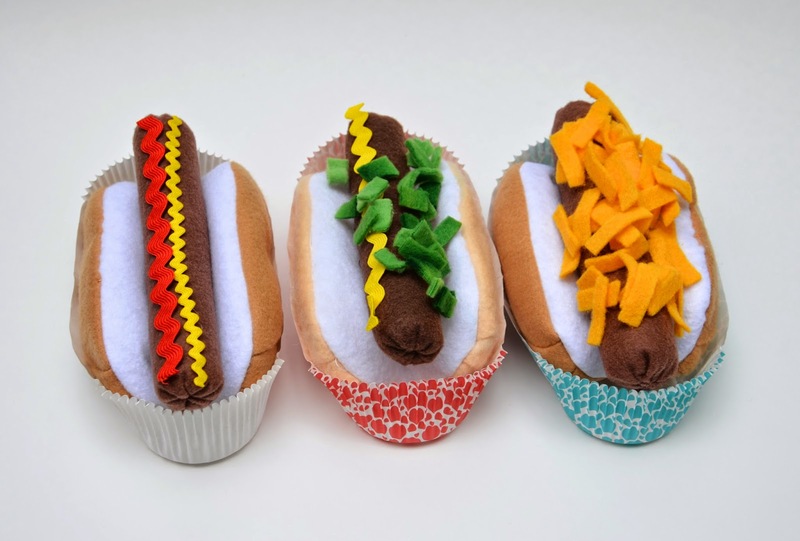 Four Stages - sausage, bun, grill and toppings. Follow along below, and print out a template at the end of the post. Please be reminded that these are for non-commercial use only - meaning that while your kids can fake-sell them to fake customers in their fake restaurants, you cannot sell them to real customers in your real shops. 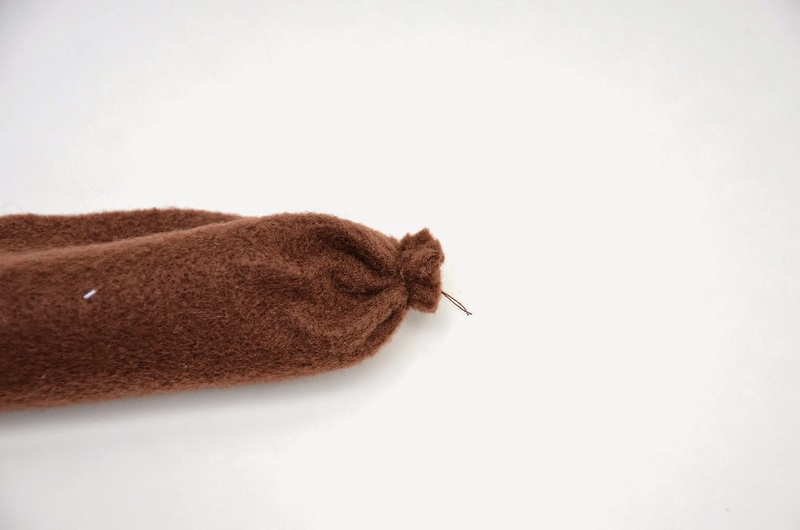 I used craft felt for this project, because it was cheaper. 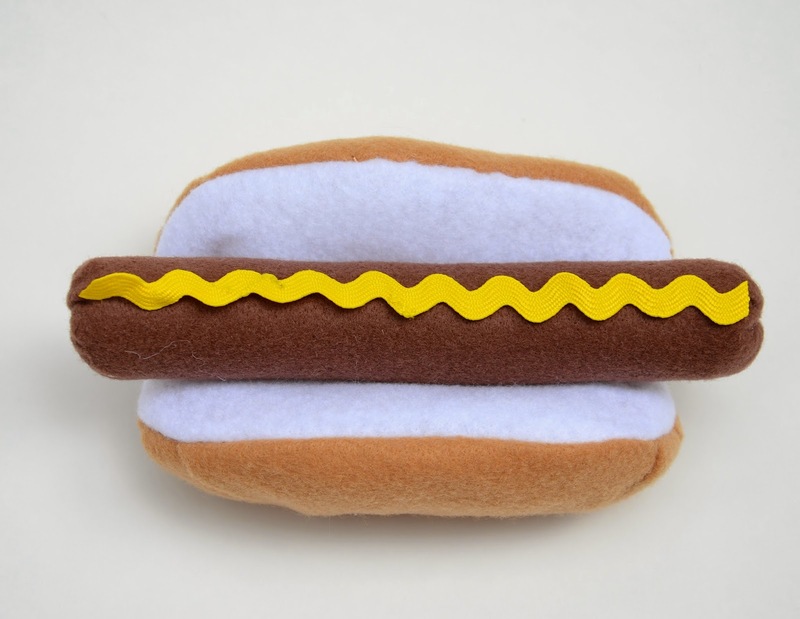 Feel free to use the pricey 100% wool felt for your hot dog restaurant. 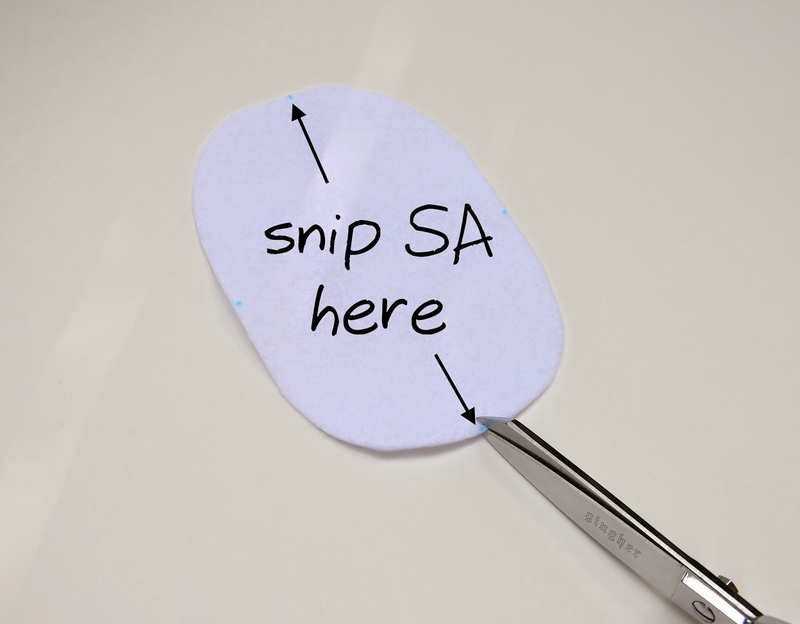 Also, uncharacteristically, I included the 1/4" SA in all the dimensions and templates, so you don't need to add your own. 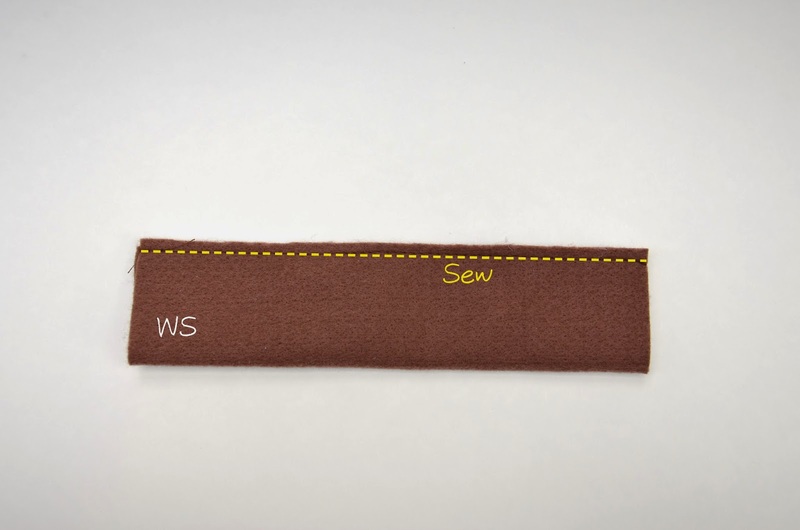 Cut a 4" x 7" rectangle of brown felt and fold in half lengthwise, RS together. I will show you two methods to make the sausage, and you pick the one you like more. 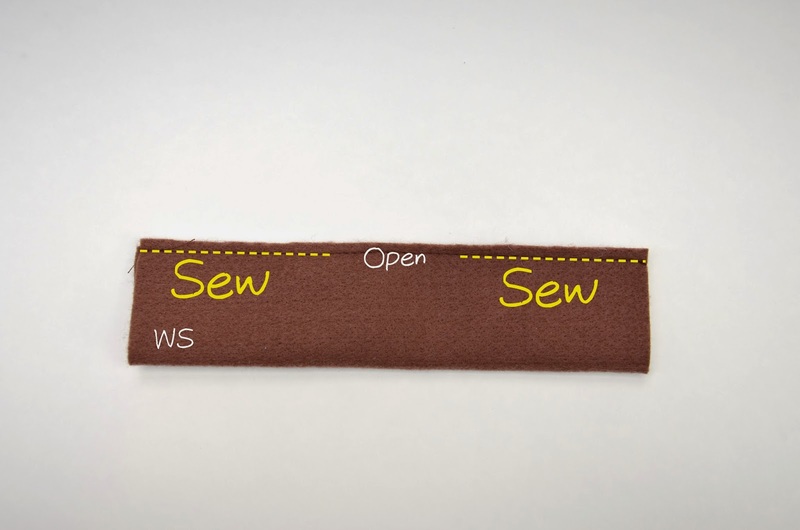 Sew the long edges together to make a tube. While still WS out, gather one end (use basting stitches) tightly and secure. Turn RS out through the other open end and stuff. The end you gathered shut will look like this. 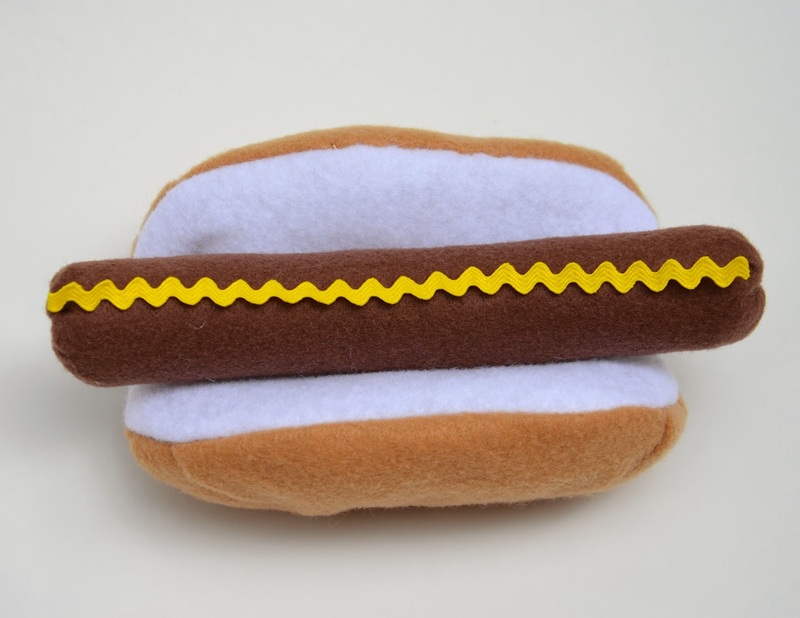 Perfect hot dog end. Gather-and-stitch shut the remaining open end, shoving the SA back into the sausage, to mimic the look of the Perfect Hot Dog End as possible. Here is my best effort - the one on the left. Not Perfect at all. 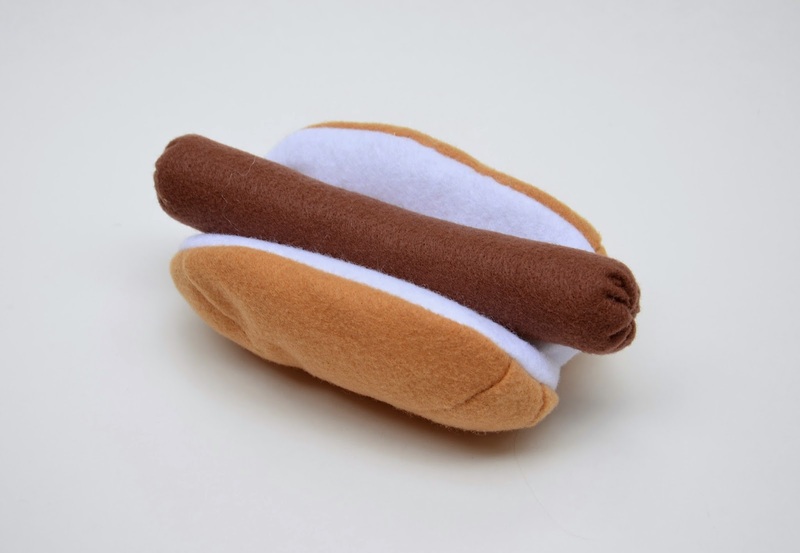 Compare that to the one on the right, which is the Perfect Hot Dog End sewn from the WS, earlier. I strongly recommend this method. 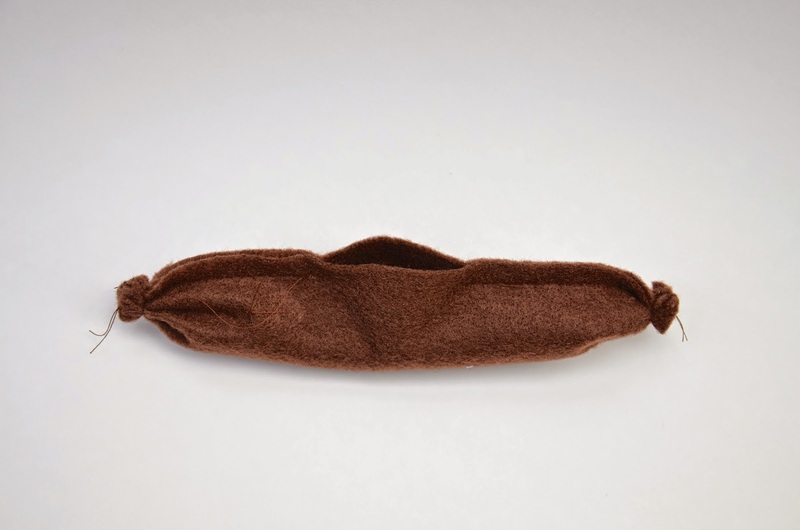 Sew the long edges together to make a tube, but leave a small section open for turning out. Gather-and-secure shut BOTH ends. Turn RS out through the middle opening and stuff. 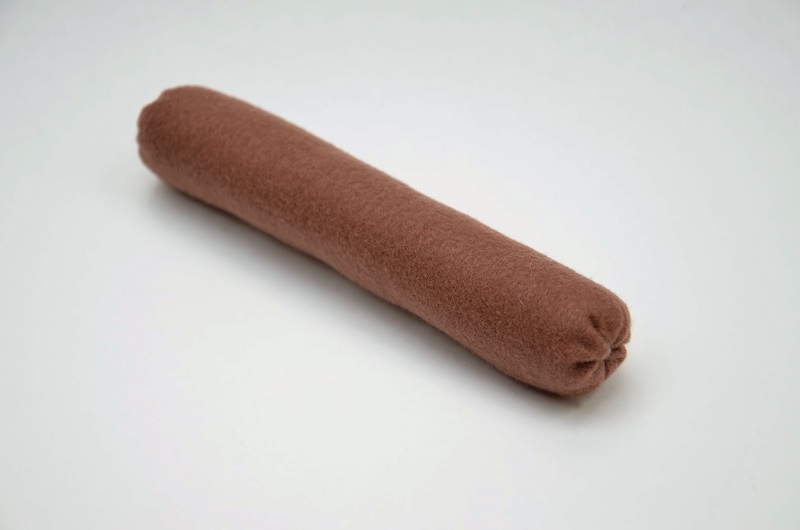 Completed sausage, by either method. Note: Be prepared for some easing and such while fitting the two parts of the bun together. Some of those darts in the brown piece are skewed. 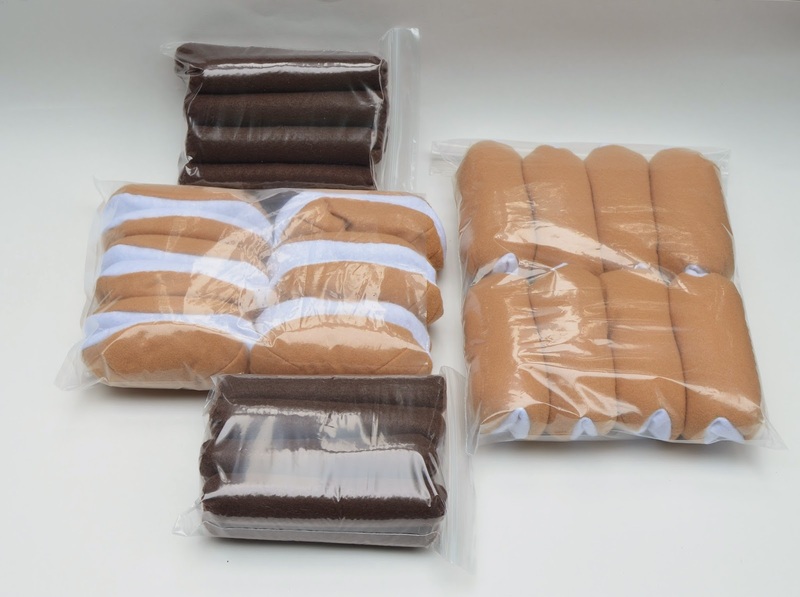 This is deliberate, to shape the round ends of the bun. 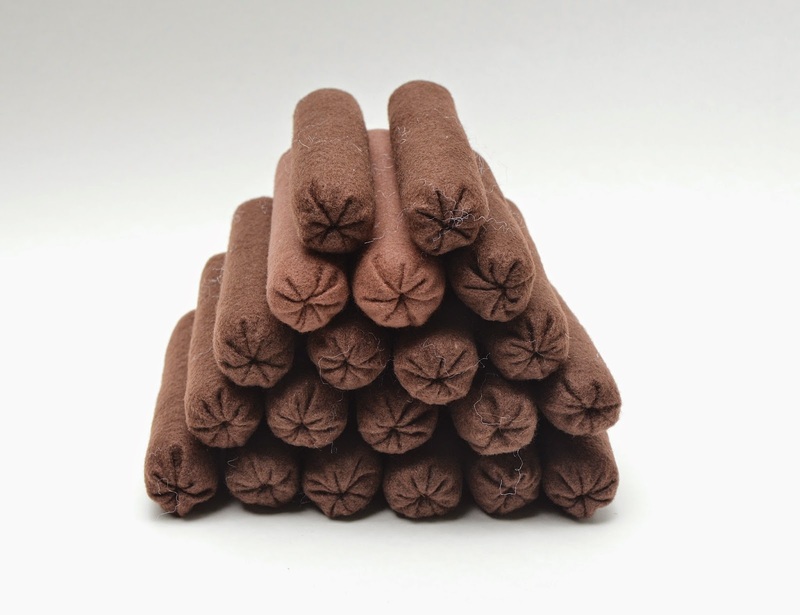 However, it does mean that the final edge of that brown piece, after all the darts are sewn closed, will be a bit jagged. You'll see what I mean later. If I hadn't made it for the purpose of mass-producing, I'd have drafted the outline of the template to be correspondingly jagged, but it would've been a nightmare to mass-cut. So I went with the lesser of two evils, and it just means that we'll have to use our common sense a bit instead of just blindly following a pattern, when we're doing the actual assembling, okay? 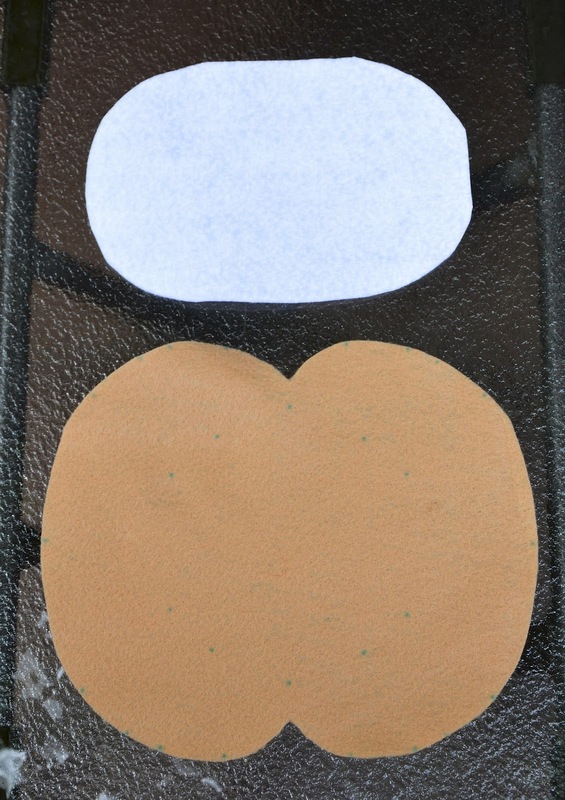 So, first cut out one of each of the bun parts - the brown outside part, and the white/ivory inside part. Mark out all the points from the templates - the numbers as well as the letters. I marked all of my points on the WS of my two pieces, but you might want to follow the instructions on the templates and mark some on the RS. First, sew closed all 8 darts. Note that these are all CURVED concave darts. None of these will be straight lines, so for heaven's sake, don't use a ruler to draw any dart legs. 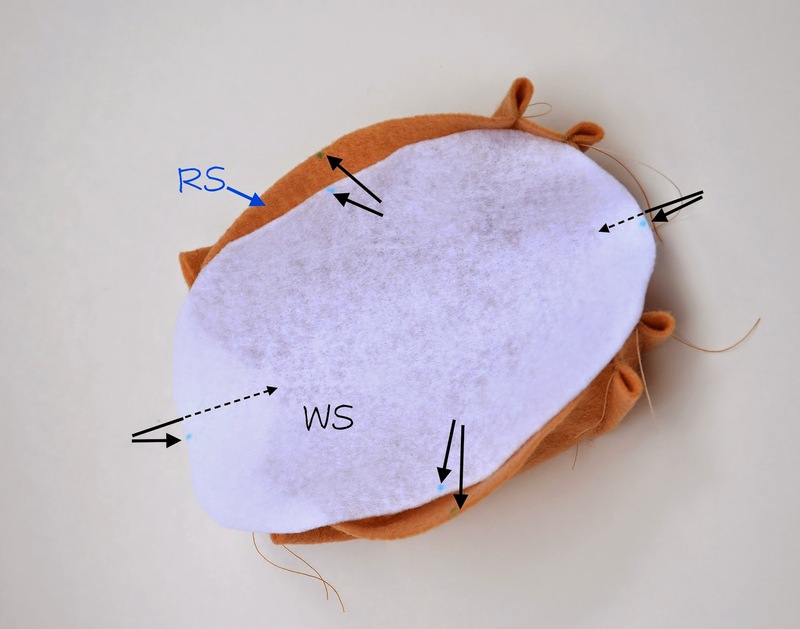 I've sketched in a pair of sample curved darts (A D1 A and B D2 B) on the template for a guide, but you should just sew them free-hand/free-eye as best you can. Now, in each pair of darts, one of them will be symmetrical (A, D, E, H). 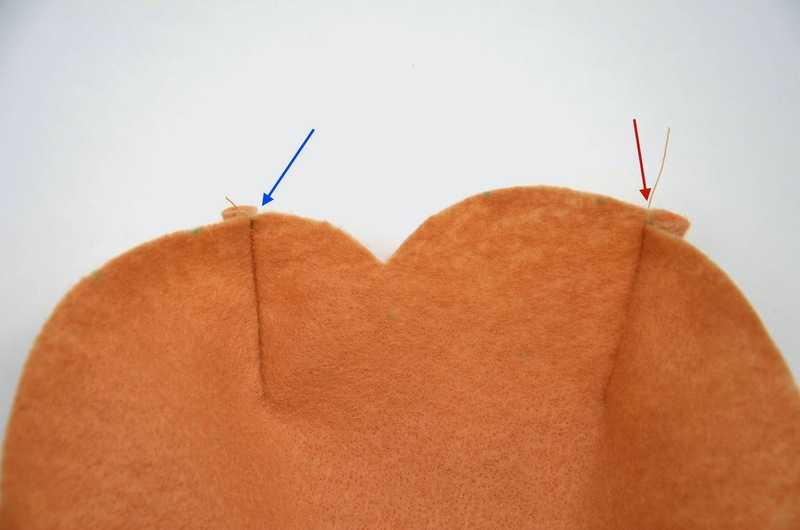 This means that when you fold it in half to sew it shut, the end points of the dart will meet up quite nicely (see blue arrow). The other dart in each pair (B, C, F and G) is skewed, meaning that its dart legs are not the same length and the dart will deliberately slant to the side. So when you fold the dart in half with its apex/point along the midline (green arrow), the end points of the dart (red arrow) will not match up. Here's a shot below of those two kinds of darts sewn shut. You can see the smooth edge (blue arrow) vs. the uneven edge (red arrow). This is what I was talking about in the intro note to this section. I should have drafted the template with a jagged outline to compensate, but I didn't, because a smooth-outline template was easier to cut out 20 times for 20 buns than a jagged-outline template. I'm drawing your attention to this because I know of people who like following sewing patterns and complaining about seamlines and points and dart legs that don't "match up" to the nearest nanometer. I commiserate with your frustration but I also feel that you should stop griping and just adjust your seams with a little common sense and move on. No pattern will ever match up perfectly AND fit your body exactly without tweaking because the commercial pattern designers did not draft it for you specifically. Get over it. Okay, I'll stop now; this is not a drafting post. 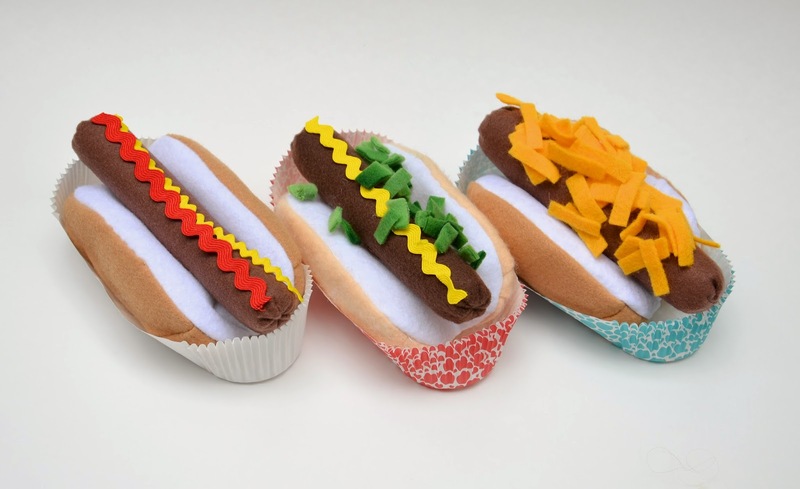 We are, after all, just sewing felt food. So back to the bun and it's weird darts. 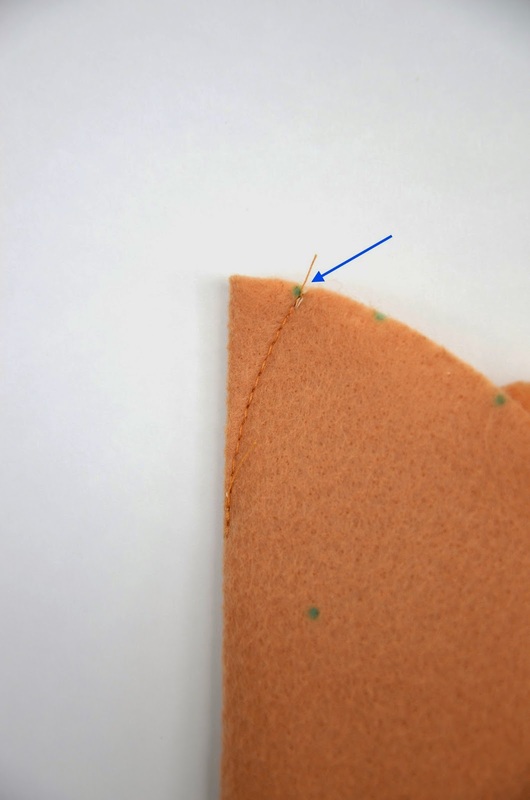 What this simply means for you is that you should trim the sticky-out bits after sewing the 4 weird darts shut, and smooth the outline as best you can. It won't matter much to the overall shape of the bun. 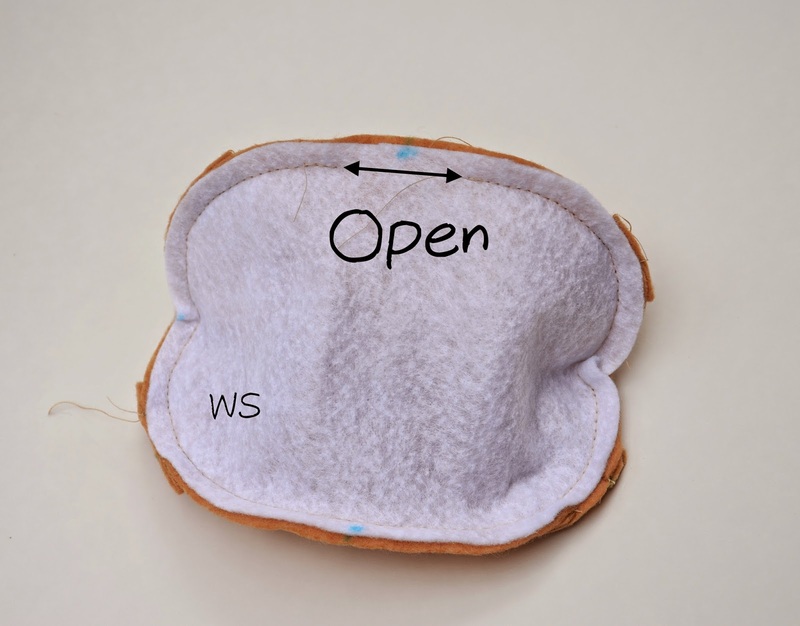 Or, if you are like me, you could just keep sewing the bun with the uneven outline without trimming anything, and ease in the white piece accordingly. and bring those two pieces together, RS touching. Leaving an opening for turning out. 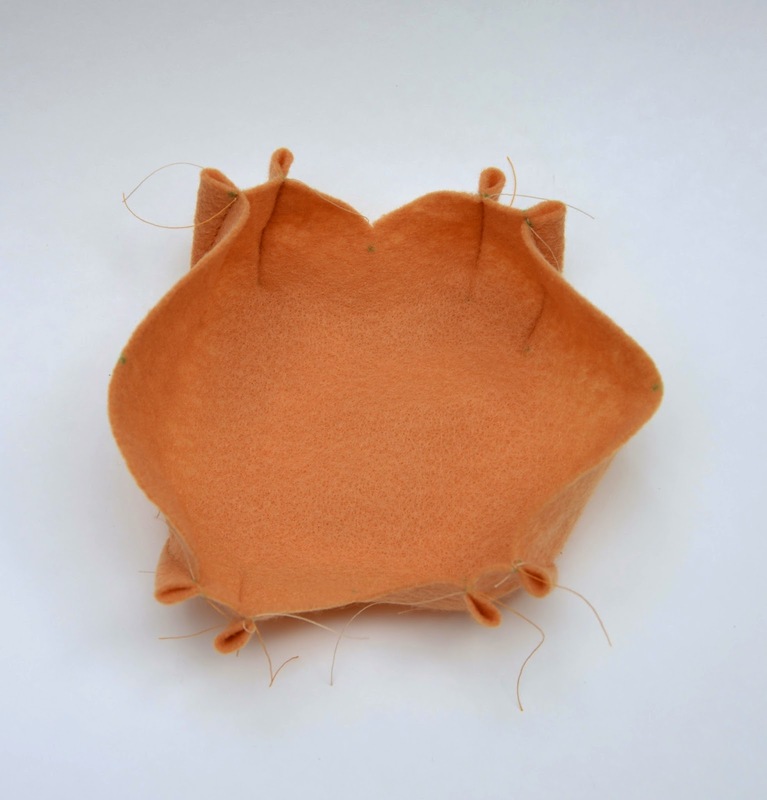 sew the white piece to the brown piece. The trickiest bits will be points 1 and 3, where you'd have to lift-and-turn your presser foot a fair bit. 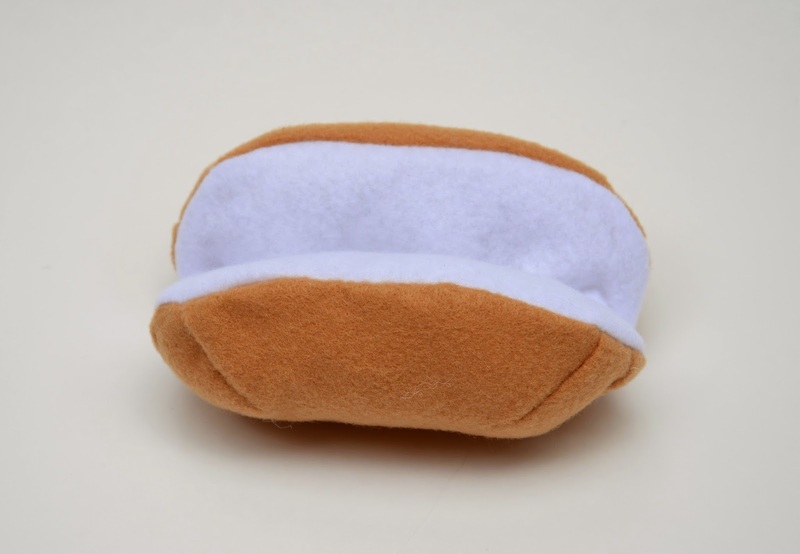 A note about stuffing the bun: do not overstuff it, or it will open flat out and refuse to fold close even a little bit. 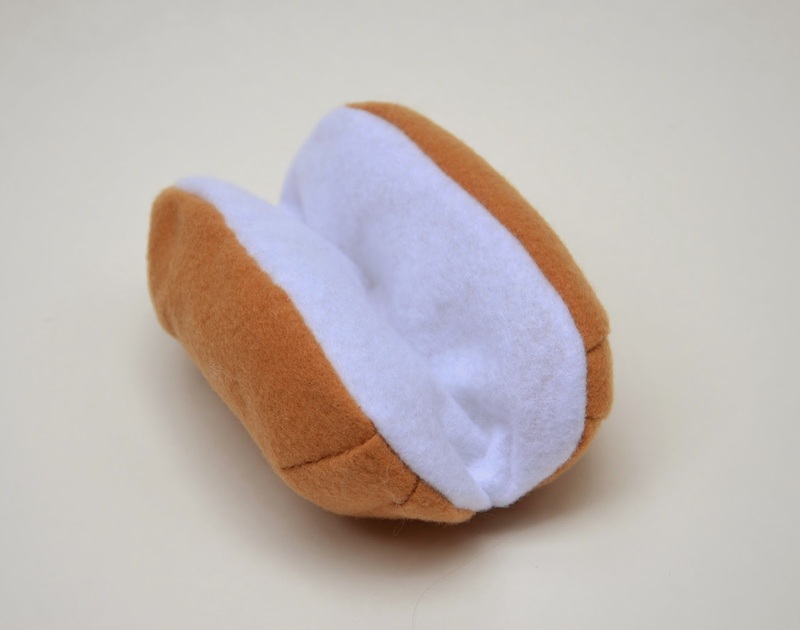 Localize the (modest) stuffing in the two halves of the bun, leaving the fold area completely unstuffed. For a cheap thrill, pack them as you might see them in supermarkets (the kids got a laugh out of this). 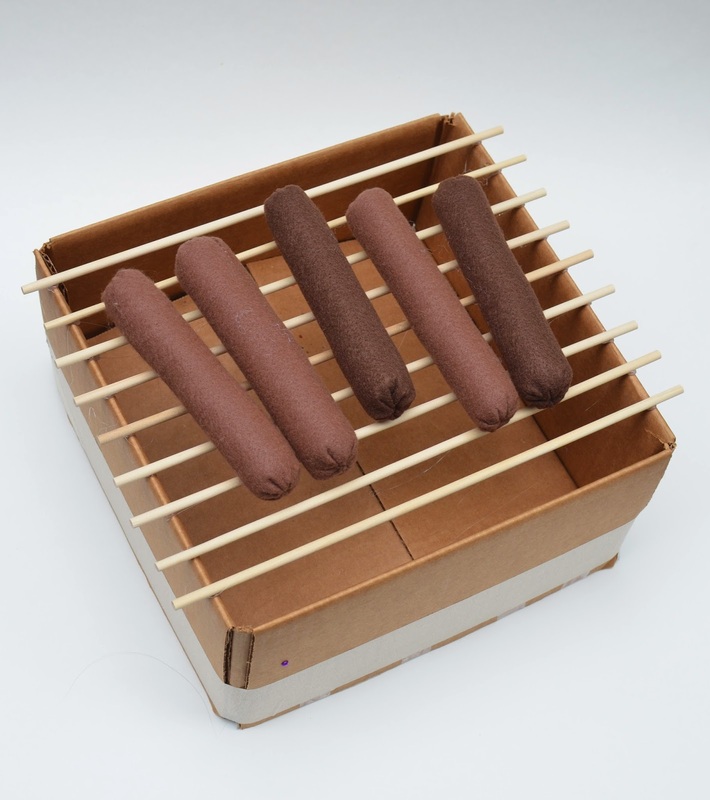 I found some of these hot dog paper trays in JoAnn in their summer clearance section. 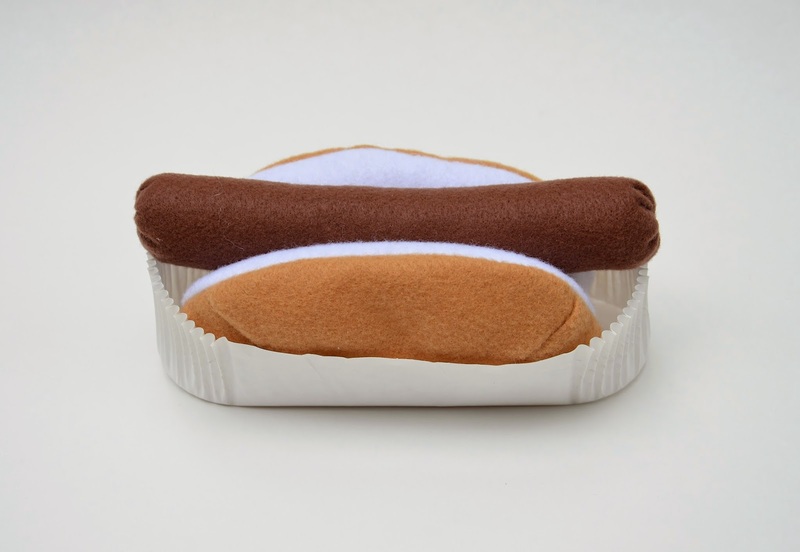 They were perfect for sanitary hot dog handling. This is the most important part of the restaurant, being cardboard and all. It took me 5 minutes to make. 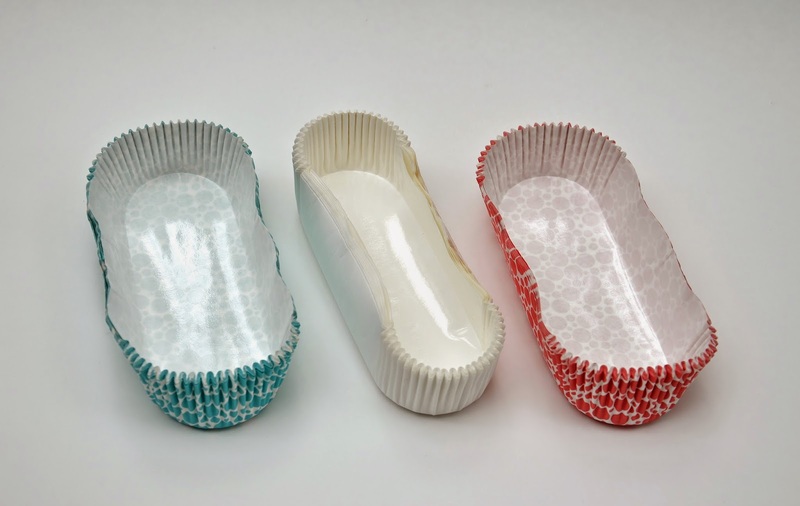 Find a cardboard box and tape down the flaps (or just cut them off). 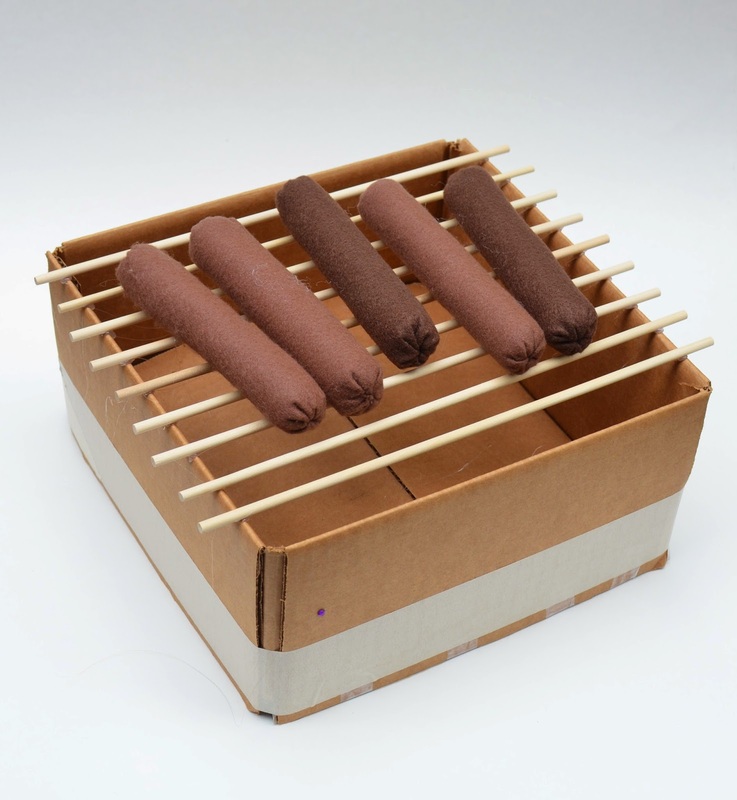 Buy a pack of skinny dowels and hot-glue them at regular intervals across the opening of the box. 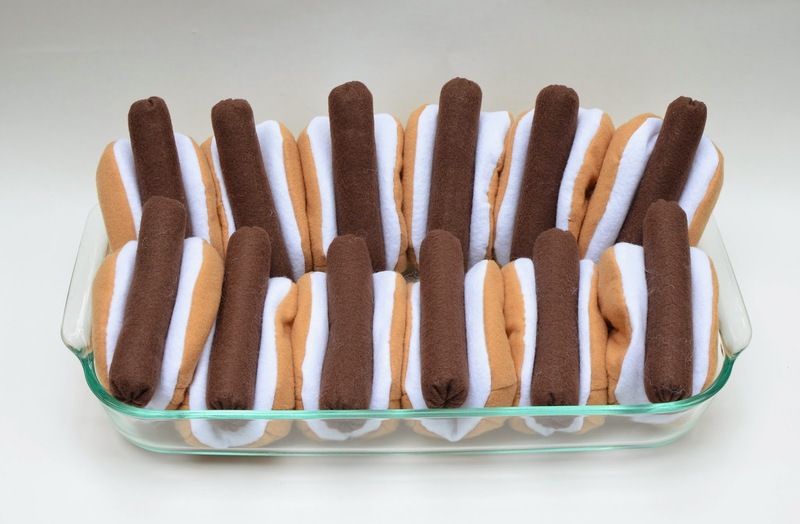 Side note about the hot dog colors: those three lighter dogs were my "muslin" hot dogs, which I made from some leftover brown felt sheets. I like their shade of brown more than the darker dogs, but I ran out. 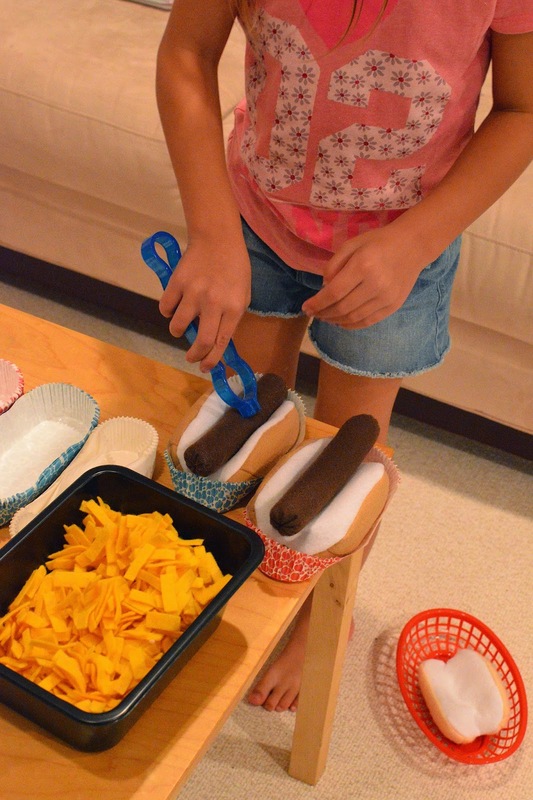 Unsurprisingly, the girls noticed immediately that the hot dogs were differently-colored and rather than deducing, "Oh, Mom used random fabric as usual, " they assigned different sausage-species-qualities to them. The light ones were brats, said Jenna, and the dark ones were "regular" (whatever that meant). Funny. 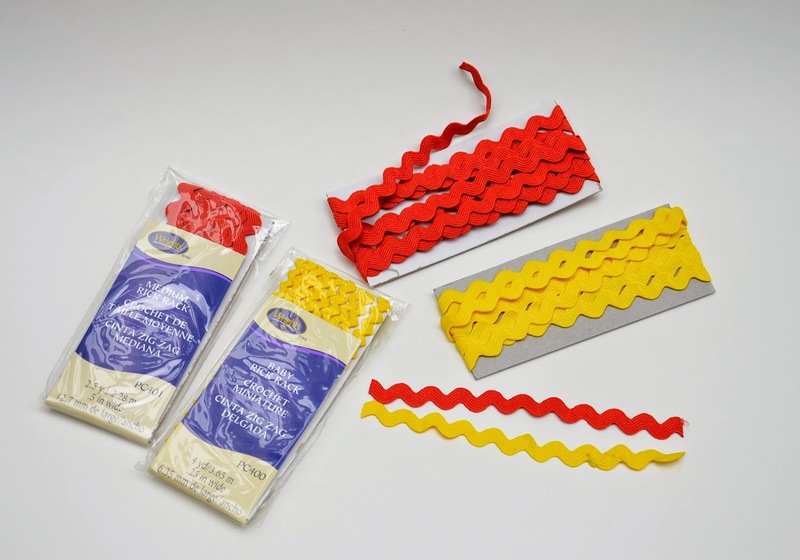 Let me recommend a faster and less mind-numbing way of making ketchup and mustard. 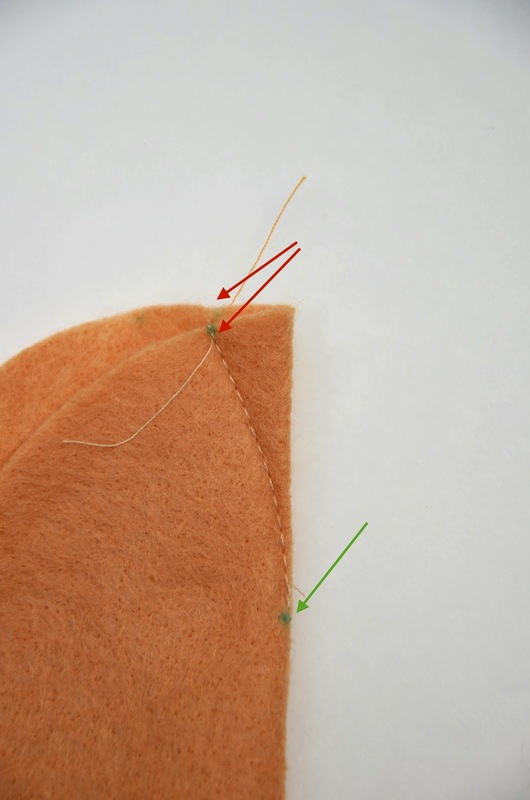 Rather than painstakingly cutting wavy felt shapes, just buy ric rac and snip them to the lengths you want, fray-checking the cut ends if you feel like it. We used two different sizes for the mustard, so that customers could choose More Mustard vs. Less Mustard. The ketchup, though, came in one-size-fits-all, because I've never heard of anyone wanting less ketchup. We kept the other toppings simple: just cheese borrowed from the pizzeria, and brand new relish, which was a variegated green fleece rotary-cut into small bits. Incidentally, the bun in the middle was my "muslin" bun and, again, I used some random felt that was different from the other buns. The girls similarly picked up on the disparity and labeled it "the whole wheat bun" vs. "the regular". If you've never eavesdropped on your kids playing, I highly recommend it. Then save up those nuggets to share with your spouse for late night chortling. Here is the template download. This is brilliant! 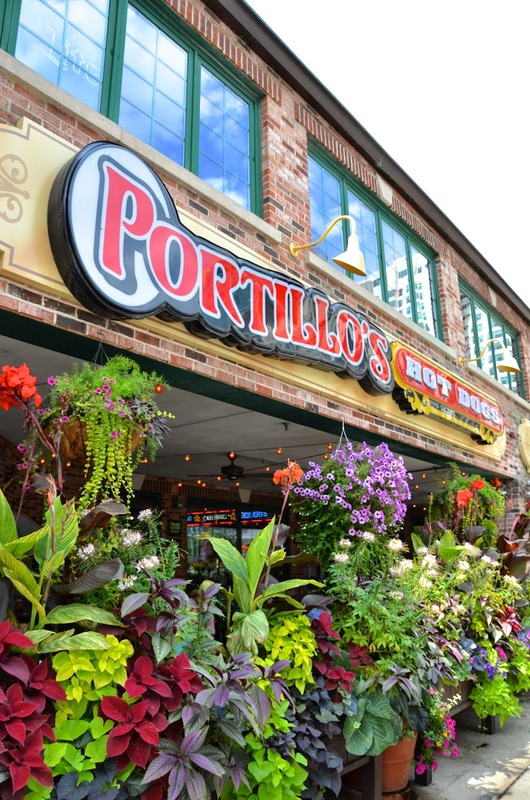 When I first moved to Chicago I ate at Portillo's in River North but eventually settled on Weiner's Circle in Lakeview. 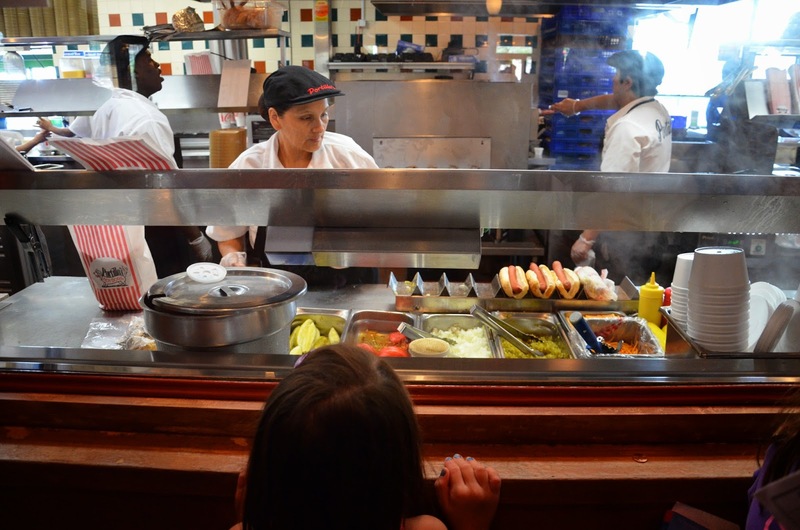 How I miss Chicago's legendary dogs. So funny, I'm sure my little daughter will love it ! Thank you for tuto !! Amazing! Thanks for sharing! I may attempt this...in my spare time, of course! Wow, wow, wow, it is so great! It is really a good idea and it will bring lots of hours for play! I love to read your blog and a time ago I did your idea from the tree house, my son liked to play with it. Thank you for telling your ideas. Greets from switzerland, Michi. 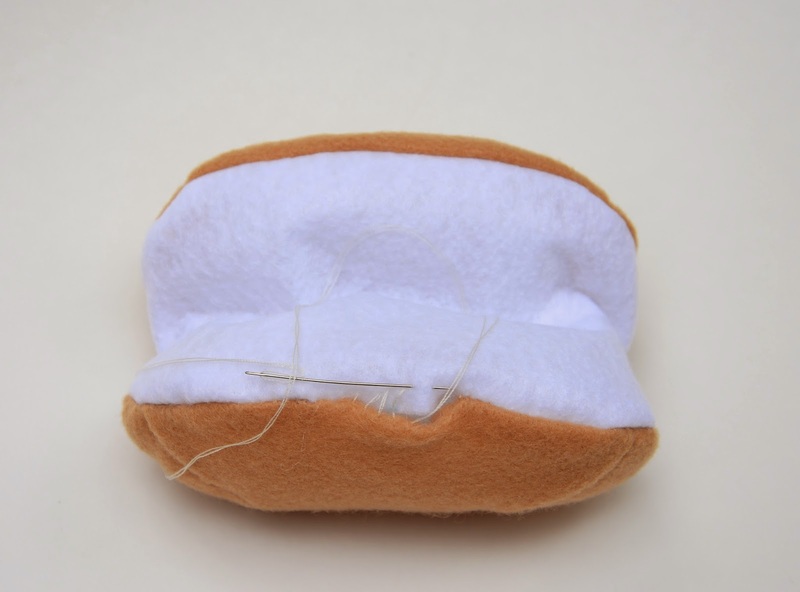 Ok, here is an easy way to get the other end of the sausage looking neat as well, if you use the first method of sewing. First gather and tie the end very close to the edge. It is protruding, no problem. 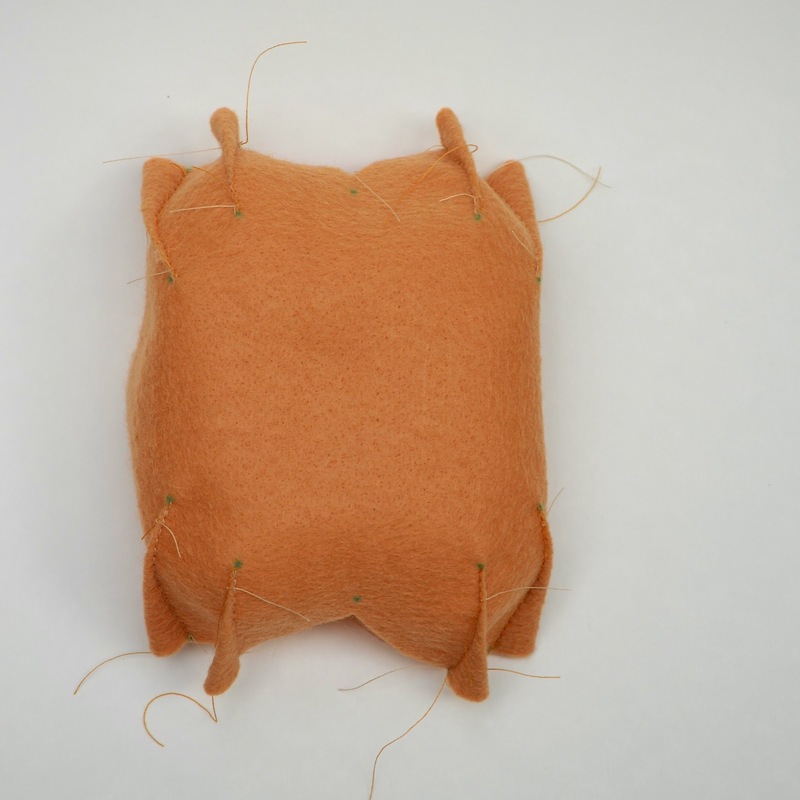 Now place the gathering stitch all around it, leave it loose, and push the protruding tied end inside with the help of something narrow like the pointy end of a barbecue stick or pencil, while simultaneously tightening the gathering stitch. 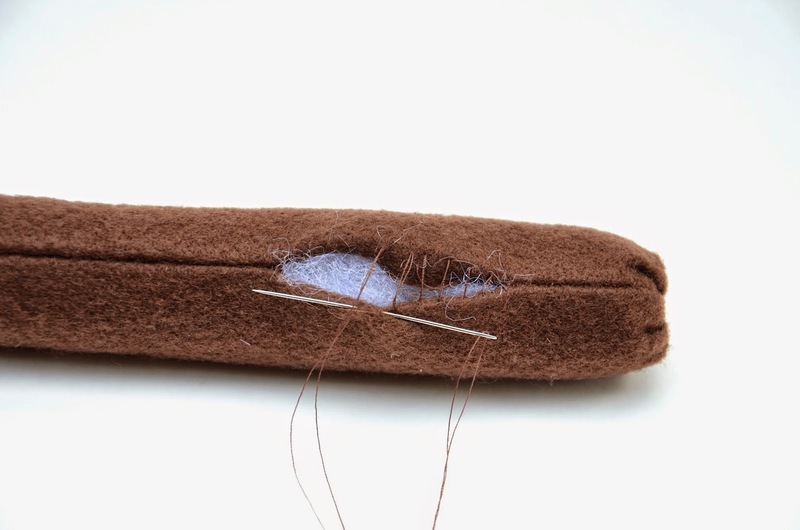 As soon as the knotty part is safely inside, withdraw the pencil and quickly tie off the stitch, cut one end short and using the needle, get the other end inside the sausage to come out anywhere else - when you cut it. Does it make sense? I can draw you a diagram, but I'd have to email you. Its actually fairly easy once you get the hang of it. Initially you may need someone else to do the pushing and holding the end bit while you tie the thread. Thanks, Swati! Everyone who wants to do one step less of handsewing i.e. Method 1, read this! Duly noted, Jess! And will educate the children accordingly. 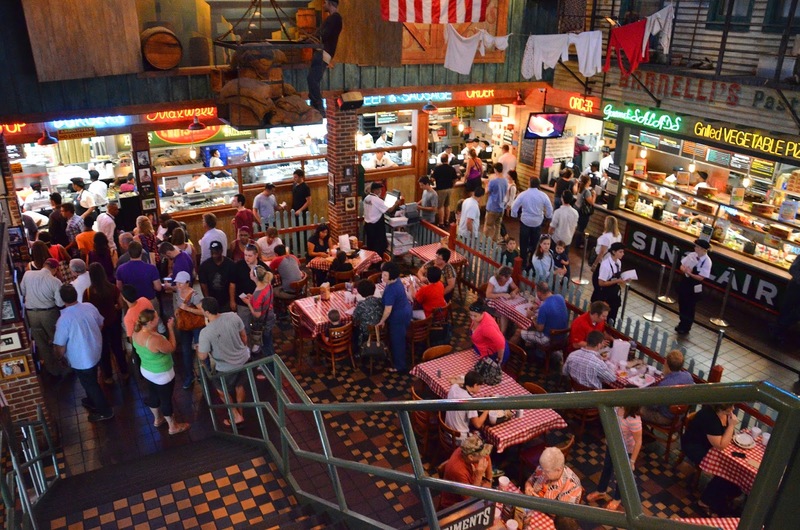 Right now they're planning to import their felt pizza toppings to the hot dog restaurant. 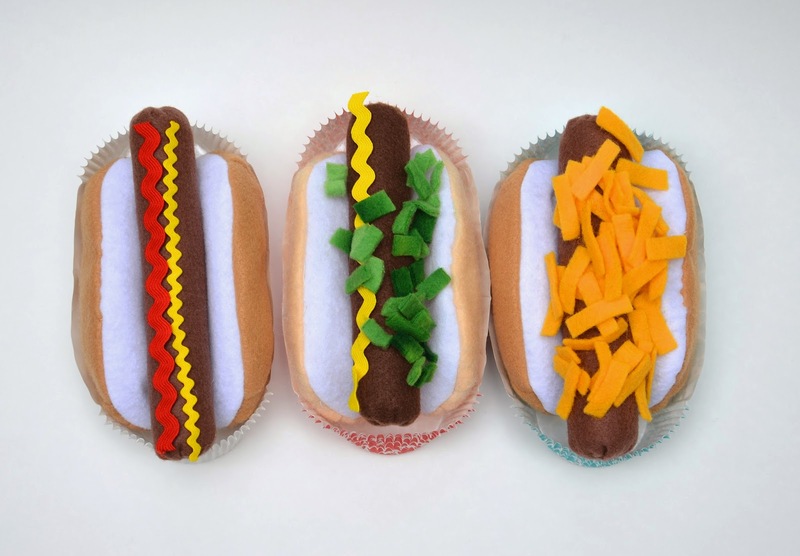 I shall have to do research to find out state/country has dogs with squid and fish toppings. With olives and mushrooms. But no ketchup. Amazing. Love. You're my new favorite mom blog! I have a son that loves crafts and would love a book like that. 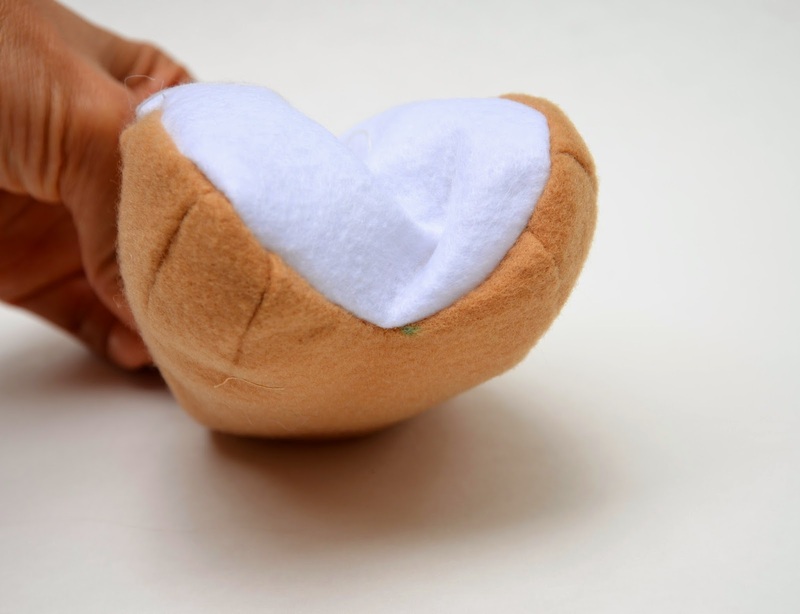 That's really nice if you to share the tutorial and pattern with us! I'm trying to stock up my two little boys kitchen for Christmas and don't want to have to buy patterns. Thanks so much! 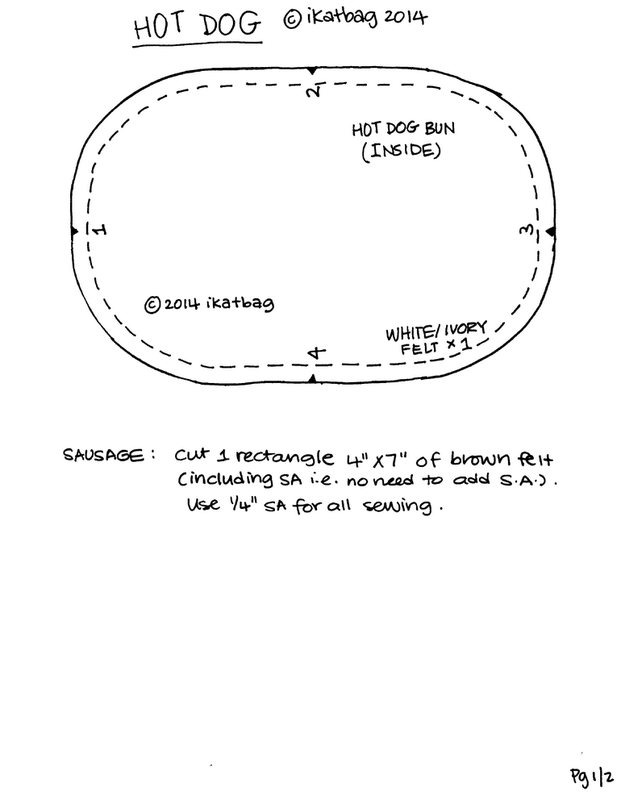 I just found the patterns for your hot dogs and buns and want to make them for my granddaughters's 4th birthday but I'm confused about the bun template. 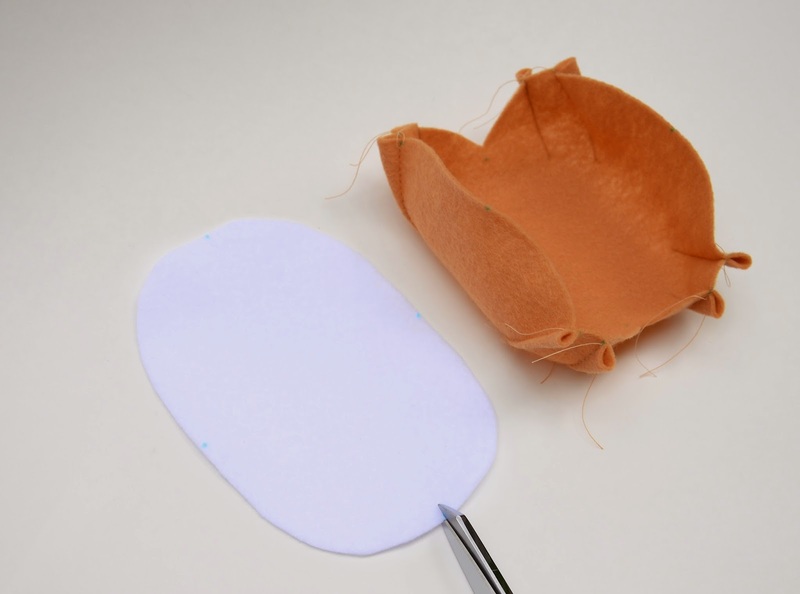 Do you place inner white piece on fold to get template for the outer brown piece and how do you mark for the darts then????? ellen booth: there are two pages of templates. The brown piece with the darts is on the second page. Don't click on the image; click on the sentence below that that says "CLICK HERE TO DOWNLOAD", which will take you to the site from which you can download the entire file and save it to your computer.